Since the invention of the bolt and nut around 400 BC people have used them to join various components together, in a wide variety of applications. Over the centuries the technology and how it relates to bolted joint integrity has improved significantly. Whether this method of joining components together is simply for the purpose of assembly of component parts, for example a wheel to a bicycle, or for more sophisticated applications like a turbine rotor, the integrity of the joint i.e. the consistent and sustainable "clamping force" generated within the bolt, to maintain the two components together, without risk of loosening and loss of joint integrity, cannot be underestimated, says Laura Thompson, marketing director, Hi-Force, a leading designer, manufacturer and supplier of hydraulic tools. This is particularly relevant when bolted joint technology is used in pipelines, pressure vessels, valves and heat exchangers where hydrocarbons and combustible fluids and gases are processed and moved around. Bolted joints in such applications are usually of a flange design utilising a number of bolts in a circular pattern, in conjunction with a sealing material (gasket), to provide a clamping force to hold two flanges together, maintaining a leak free condition. 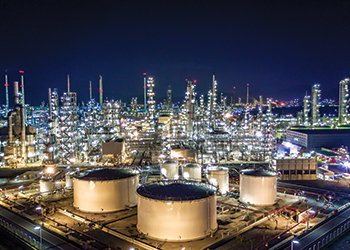 Typically an average size oil, gas or petrochemical facility will contain in the region of 30,000 to 50,000 bolted joints, all of which have the potential to leak and create a risk to the plant, the environment and potential loss of life. Yes some leaks could and do result in a minor, low risk incident, but others could lead to a catastrophic loss of life and assets, as well as major damage to the environment, within the local proximity of the plant, she notes. This can also easily escalate to the wider area, dependent on the location of the plant, with the inevitable damage to the reputation of all involved. It is surely agreed that any loss of life and asset is both regretted and avoidable and history has shown that major catastrophes can and do happen and the costs can run to millions and sometimes billions of dollars! So why does one use bolting technology to join components together? Well firstly it makes the whole construction process easier to manage, secondly by bolting components together it provides the essential access required to carry out regular maintenance, or in the case of a failure of an individual component, it can be dismantled and removed In order that the failed component(s) can be repaired or replaced. Pipelines and pressure vessels, that move and process hydrocarbons, need to be regularly cleaned and maintained and this process is usually carried out during a planned maintenance shutdown or outage. Clearly the planning of this is key to ensure that a clear and defined work scope, is prepared, that includes all the necessary tooling and expertise required, says Thompson. During construction and commissioning of new facilities, the issue of correct "bolt up" of critical and non-critical joints, is often an oversight, during the construction contractor bidding phase, which usually results in conflict, between the plant owners, EPC contractors and the construction sub-contractors, around who is responsible, for the cost and provision of the required bolting tools and the necessary expertise, to carry out the bolting work. In many cases, due to a lack of available tooling and expertise the construction contractors suffer from conflict, with the pre-commissioning and commissioning teams, as a result of leaks from incorrectly assembled bolted joints during construction phase and from incorrectly pre-assembled components, supplied by third parties, that only come to light during pre-commissioning and joint integrity pressure testing. Plant owners often apply severe penalties, to the EPC contractors for late delivery of the plant, delays which in many cases are due to rework and rectification of leaking joints. It is generally agreed that improvement in bolted joint integrity is one of the most significant areas, requiring attention, both on the site and at all levels of plant facilities management. So how can the whole process around "Bolted Joint Integrity" be improved and implemented, to help reduce the risks and costs related to loss of life, assets, environmental issues and project completion delay penalties? "Well I believe that we all agree that firstly all parties involved need to change their mind-set and buy into the benefits of implementing the necessary policies and procedures, required to deliver a comprehensive joint integrity programme, at the respective project," she says. This is particularly applicable to new-builds but can also deliver significant time and cost savings during shutdown maintenance, provided everything is planned in advance. A mind-set of "First Time Right" is key to the success of the implementation of the entire bolted joint integrity programme. Rework costs will always be multiples of the original assembly costs, so surely a significant reduction in rework is something everyone involved is keen to achieve? As a major, UK headquartered manufacturer, Hi-Force, with overseas regional offices in Holland, Italy, UAE, Saudi Arabia, Azerbaijan, Malaysia and South Africa, has over thirty years’ experience in the design, manufacture, operation and use of manual, pneumatic and hydraulic bolting tools. Hi-Force UK operates from a "state-of-the-art" manufacturing facility, located in Daventry, England, that houses everything from product design, through to manufacture, assembly, testing and certification, of an extensive range of bolting tools, as well as many other types of high pressure hydraulic tooling. Hi-Force also offers full after sales and service support, through all of its strategically placed regional offices and authorised and trained distributors, in almost 100 countries worldwide. For many years Hi-Force has also offered clients short and long term tool rental and in 2016 this service was formally extended, to offering complete on-site Bolted Joint Integrity management, during plant construction and maintenance shutdown activities. The Hi-Force On-Site Bolting Services Division, managed from the Hi-Force UK Head Office, can now offer clients pre-start on-site surveys, full and comprehensive analysis of bolted joint needs and requirements, development of correct procedures, including all required bolted joint load calculations, on-site supervision, using ECITB qualified and trained supervisors, on-site bolted joint integrity training courses, for the nominated contractors technicians, full flange management control, utilising the Hi-Force BOLTRIGHT PRO calculation software and of course high quality UK manufactured bolting tools. 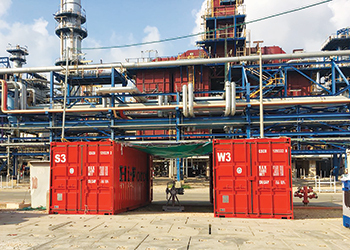 "As part of the Hi-Force On-Site Bolting Services offering, we are able to mobilise to site bespoke twenty foot containers, fully equipped, as either a bolting tool store, or a mobile on-site training facility, incorporating all the necessary training equipment, to deliver bolting training courses, to the highest possible standard," she says. Group managing director of Hi-Force, Kevin Brown, is directly heading this new division, within the Hi-Force Group and enthusiastically claims: "Hi-Force is always looking to expand its offering to clients worldwide and this new venture has already delivered significant results in recent months. We currently have four containers mobilised, two each to two different plant construction sites and our clients are already seeing the benefit of employing a specialist Bolting Services Company, to manage all of their joint integrity needs at site. "A further two bespoke containers have also recently been ordered. The issue of purchasing of capital intensive bolting tools, is no longer a requirement for the site, because we are offering competitively priced tool rental, throughout the project, with our own on-site tool service repair facilities, fully supported by readily available spare parts, to ensure bolting work is continuously carried out. Our on-site Supervisors have all the necessary skills to supervise the bolting work, carry out bolting work when necessary, conduct high quality training courses at site and of course carry out any required tool service and repair work." For further information on Hi-Force On-Site Bolting Services and Bolted Joint Integrity Management please go to www.hi-force.com and register your interest.